Football been the most popular and watched game worldwide is growing in many places, even the USA not considered a soccer (as it is called there) loving nation, is gradually getting a huge audience. The game of football is now getting all the attention partly because of two players. These are Cristiano Ronaldo and Lionel Messi. These two are the most popular figures currently in the game, their background information is widely known so there isn’t much need to start delving into that and of course most people know what they stand out for, they are goal scoring machines. Their goal scoring rates having been so outstanding, they have broken so many individual records and look certain to likely break more. These two started their careers as promising players but no one would have known right from their young age they had the ability to score goals better than many of Footballs greats like Alfredo Di Stefano, Ronaldo, Ferenc Pukas, Raul among many others. Messi has spent all his years as a senior player in FC Barcelona while Ronaldo started in Sporting Lisbon before moving to Manchester United where he had 5 fantastic years. His move to Real Madrid in 2009 was the most expensive transfer ever. His huge price tag of £80 million has been largely justified as he has banged in over 200 goals for Real Madrid in his 4 years so far while Messi has done the same over that period, though Messi has been the more successful in terms of individual and club honors, one can’t argue that such is attributed to the fact that Messi has been in the most successful club in the last decade. Since Messi and Ronaldo bombard the net with goals, there has been a long standing debate as to who is a better player. 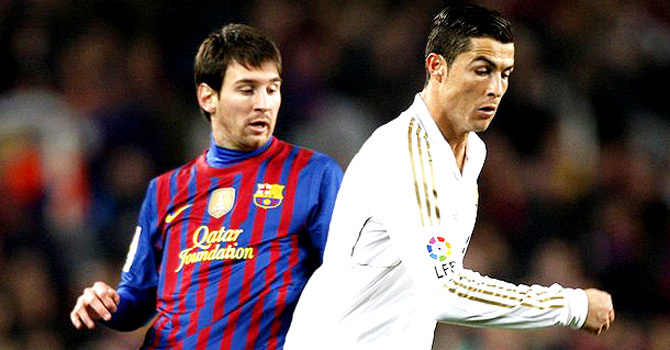 There are so many reasons to give as to who is better and most people put Messi ahead of Ronaldo. That maybe correct but that not enough not to credit the brilliance of Ronaldo too. Below are statistics of goals scored by Ronaldo and Messi starting with this season so far and their overall goals tally for club and country as well as their goal scoring ratio. Please note that all figures are correct as at 14th November, 2013. 16 league goals in 13 league appearances. 8 UCL goals in 4 UCL appearances. 24 overall goals in 17 overall appearances this season for Real Madrid. 162 overall league goals in 148 overall league appearances for Real Madrid. 43 overall UCL goals in 44 overall UCL appearances for Real Madrid. 17 overall Copa Del Rey goals in 20 overall Copa Del Rey appearances for Real Madrid. 3 overall Spanish Super Cup goals in 4 overall Spanish super cup appearances for Real Madrid. 225 overall goals in 216 overall appearances for Real Madrid. 348 overall career club goals in 539 career club appearances. 43 overall goals in 106 overall appearances for Portugal.